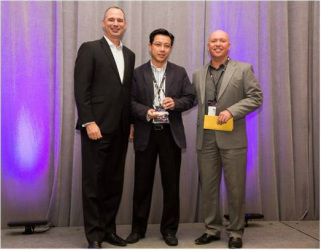 SINGAPORE, 13th February 2014 - Polycom Inc., the global leader in open standards-based unified communications and collaboration (UC&C), has named Transition Systems Group as its South East Asia Partner of the Year. Polycom honoured its partners and distributors during TEAM Polycom 2014, the company’s annual partner conference, which was held in Vancouver Convention Centre - Vancouver, British Columbia from 11th to 13th February 2014. The Polycom 2014 Partner awards focused on Innovation and Customer Success and accolades were awarded based on overall performance, execution, business results, customer successes and jointly developed innovative marketing campaigns and solutions. Transition Systems’ strong performance in 2013 was due to our investment in headcount, development of our team’s sales accreditations and technical capabilities, various marketing initiatives, as well as our dedication in providing solutions and support to Polycom customers and partners.